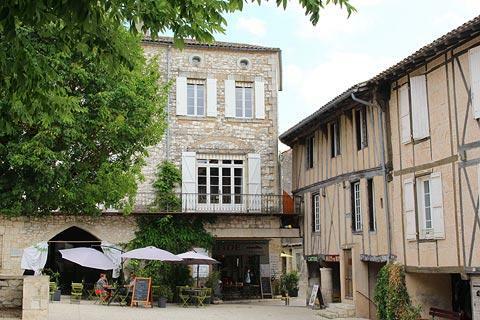 Monflanquin, listed as one of the 'most beautiful villages of France', is 15 kilometres north of Villeneuve-sur-Lot and about 25 kilometres south-east of Bergerac in the northern part of the Lot-et-Garonne department of south-west France. 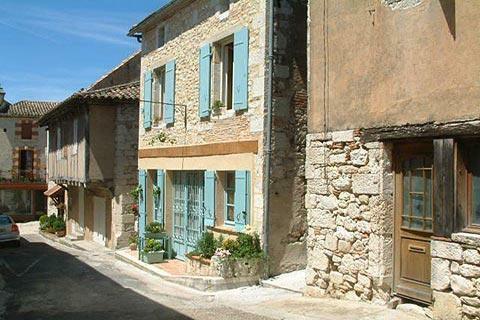 It is a French bastide town - i.e. 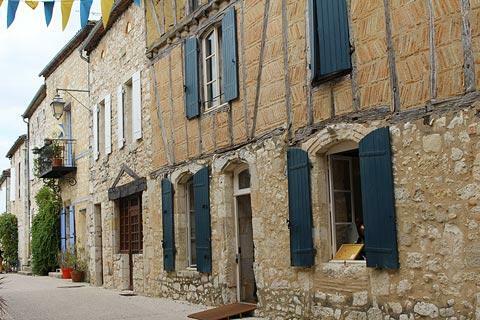 it was founded by the French in the 13th century, at a time when the English ruled much of this part of France. France This Way comment: set on a hilltop, Monflanquin is a very well preserved town and is generally agreed to be one the most historically intact examples of a medieval bastide town. The central square and the surrounding streets preserve a great deal of medieval character and a visit is recommended. There are several car parks around the edge of Monflanquin so parking is not usually difficult. 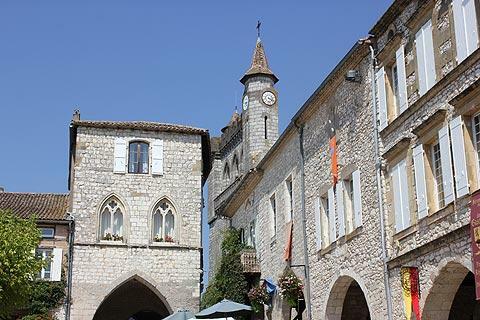 Wherever you park you will find that all streets quickly lead to the village centre and the central square in Monflanquin, the Place des Arcades. This square has beautifully preserved arcades around the edges and many other impressive buildings. The square is also home to the weekly market each Thursday, as it has been since 1256! 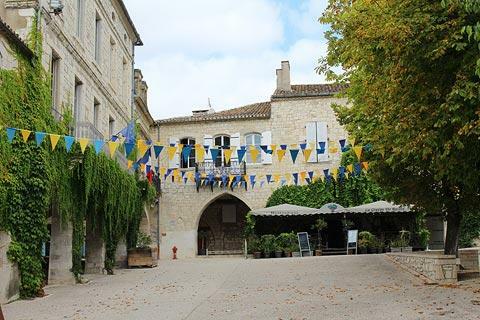 Unfortunately the original medieval market hall (as you can still see in Villereal, Monpazier and several other villages nearby) is no longer present in Monflanquin but several trees help preserve the pleasant ambiance. 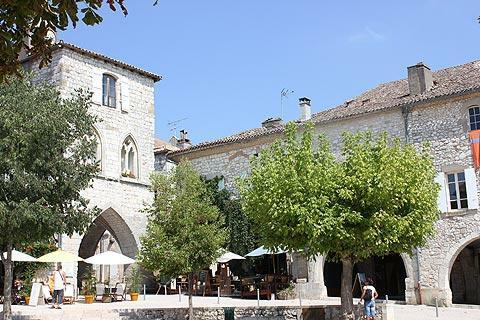 There are several good restaurants in Monflanquin, also mostly around this central square. Perhaps most noteworthy and most impressive is the 'House of the Black Prince', at the top-right of the square. The Black Prince stayed here for a while during the Hundred Years War, and not surprisingly he kept the best house for himself, but all the corner houses have suitably impressive stone arches (arcades). 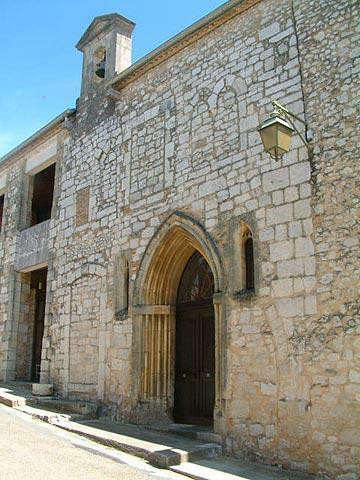 Just outside the square is the impressive 13th century Church of Saint-André, with an attractive stone entrance. 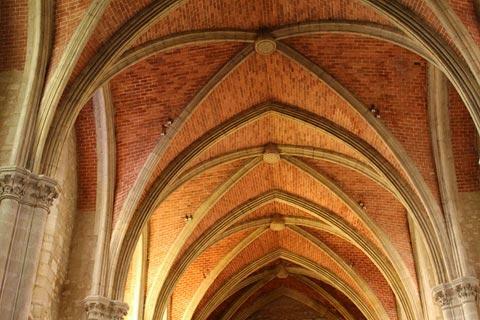 In fact significant parts of the church are recent renovations including the nave and the chevet that were rebuilt in the 18th century and - although you wouldn't perhaps guess unless you look closely - the belltower was only added in the early 20th century. No matter, it still seems very well suited to the surrounding Monflanquin architecture...in fact I'm sorry for pointing it out to you because now you will notice it straightaway! 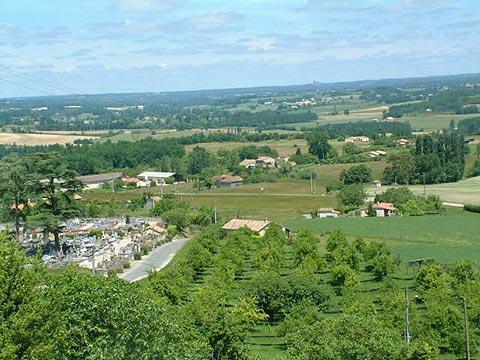 Continue a little way beyond the church to reach the top of the hill and far-reaching views across open countryside, extending to Chateau Biron on the distant horizon. 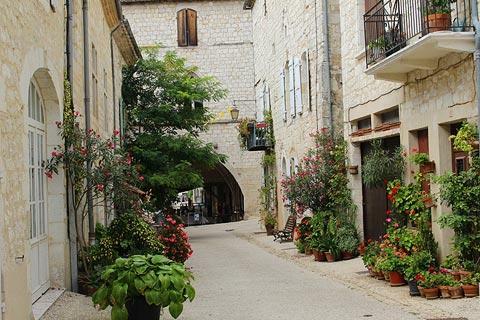 As always in medieval villages I encourage you to explore the alleys and narrow side streets that surround the centre of Monflanquin, because it is in these backstreets that you will find many of the most authentic medieval buildings and architecture, including several traditional half-timbered houses. 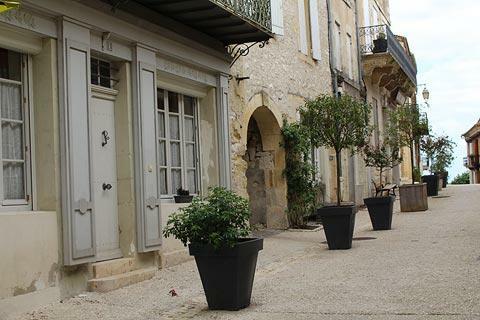 The streets follow a grid pattern typical of a bastide town and are connected by narrow alleys which seem unchanged with the centuries. 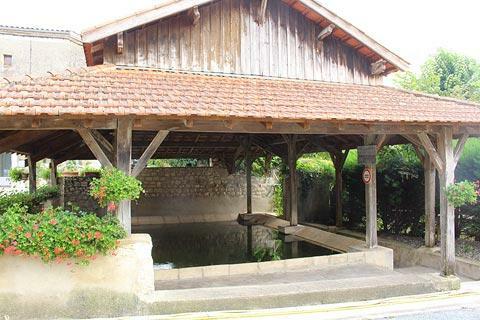 If you walk down the hill and across the main road you can discover a little known corner of Monflanquin, where several old houses surround an ancient washhouse. The busiest days in Monflanquin's annual calendar are the medieval days during which for a couple of days in the summer the town has a festival filling the town, with exhibitions of falconry, people dressed in 'olden days' clothes, lots of artificial blood and gore and you will stumble across lepers and beggars in the alleys. Don't miss it if you are in the region when it is on. 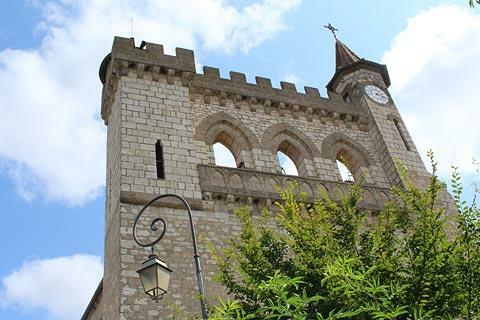 To learn more about the history of Monflanquin and the other bastide towns in the region you can visit the Museum of the Bastides in Monflanquin. Although the museum has quite a small number of exhibits it is interesting to have some understanding of how these towns came into being. 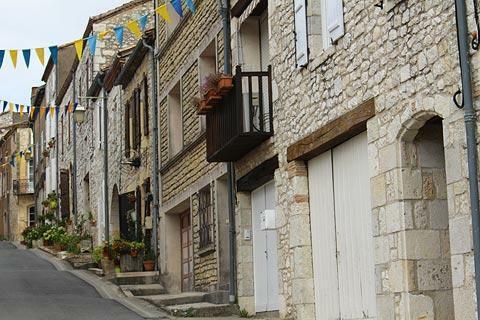 Drive a few kilometres south towards Villeneuve-sur-Lot, then turn around and drive back again! There are some great views of Monflanquin when approaching from this direction, especially early in the morning when the sun rises over the village. The whole of the southern Dordogne and northern Lot et Garonne areas are close to hand, so you won't struggle to find things to do. 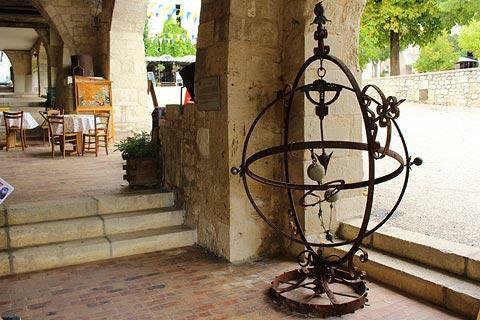 Among the other villages close to Monflanquin we particularly recommend you visit are Monpazier and Pujols (two other 'most beautiful villages in France'), and Villereal 10 kilometres to the north is also a lovely little town with an interesting medieval market hall. 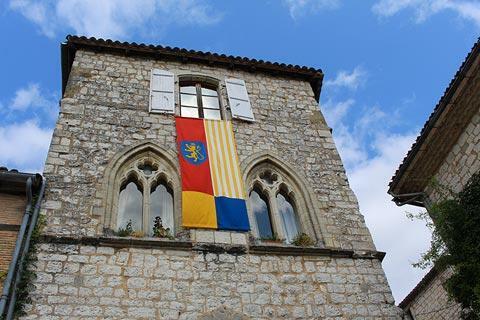 We also recommend a trip along the Gavaudun Valley, a scenic valley where you can see the imposing 13th century donjon of the Chateau de Gavaudun (and a lovely quiet road for cycling along).